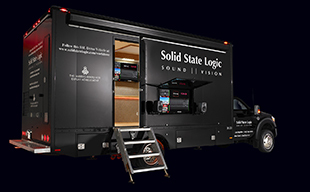 Solid State Logic, the worlds leading manufacturer of advanced tools for audio professionals, is proud to introduce LMS-16, a powerful new multi-channel Loudness and True Peak metering system for use with SSL Digital Broadcast Consoles or as a stand-alone product at IBC 2013 (Hall 8, Stand D.83). In a strategic partnership with NUGEN Audio, SSL will offer NUGEN Audios new MultiMonitor software as part of a turnkey system that will provide the software pre-installed and configured on an industrial strength 1RU PC, fitted with SSLs MadiXtreme 128 audio interface. An optional monitor arm will also be available to facilitate convenient side mounting of a screen on C100 HDS or C10 HD consoles. NUGEN Audio will also launch MultiMonitor as a standalone software product at IBC 2013. The next evolutionary step for their highly regarded VisLM software, MultiMonitor provides the most powerful multi-channel Loudness and True Peak metering available today. It offers 16 individual meters, each capable of mono, stereo or 5.1 formats (providing metering of up to 96 audio channels simultaneously) with each meter showing a LUFS momentary display alongside a True Peak display. Each meter also has a dedicated numeric Short Term and Integrated LUFS data display and meters can be colour-coded to aid grouping. Each meter also features a minimum and maximum short term alerts function. MultiMonitor is fully compliant with CALM Act legislation, ITU-R BS1770/1, ATSC A/85, EBU R128 and other specific worldwide localisations. SSLs LMS-16 offers this advanced metering in a fully configured and tested turnkey system based on an extremely powerful and robust 1RU PC with very low noise fans, a 15 second boot time and pre-built restore partition. Professional loudness metering of 96 channels of audio (@ 48 kHz) requires an exceptional amount of processing power and this pre-configured and fully tested PC delivers. Audio I/O to the system is provided by SSLs MadiXtreme 128 audio interface, offering 2 x 64 channel fibre connections. GPI connectivity for GPI reset provides seamless integration with SSL consoles and other equipment. The new optional LCD monitor arm can be fitted to existing C100 or C10 consoles regardless of trim type and without any console modification. SSLs LMS-16 is ideal for monitoring multiple playback sources or Audio Sub Groups simultaneously with 5.1 and Stereo PGM output alongside the console in the Audio Control room or equally suited in the MCR monitoring multiple studios and formats simultaneously.